DIAL: Brown ‘tropical ‘dial large three counter in black color. Inner bezel with tachymeter indication for chronograph. Large red ‘lollipop’ central chronograph seconds hand, broad arrow style hours/minutes hands. CASE: 39mm, Stainless Steel with black bi-directional rotating bezel and straight lugs, pump pusher, screw-down case-back, plastic crystal. VALJOUX was a Swiss manufacturer of mechanical watch movements. It’s known primarily for the chronograph movements that have been used in mid to high range mechanical watches in the 60’s and 70’s. Valjoux stands for Vallé de Joux, the watchmaking region that gave birth to brands like Jaeger LeCoultre and Audemars Piguet. Valjoux made many historic calibers that still are the base of many of the most reliable movements today. It was absorbed into ETA which became part of Swatch group. The Valjoux 72 is probably the most collectible caliber among these chronographs. 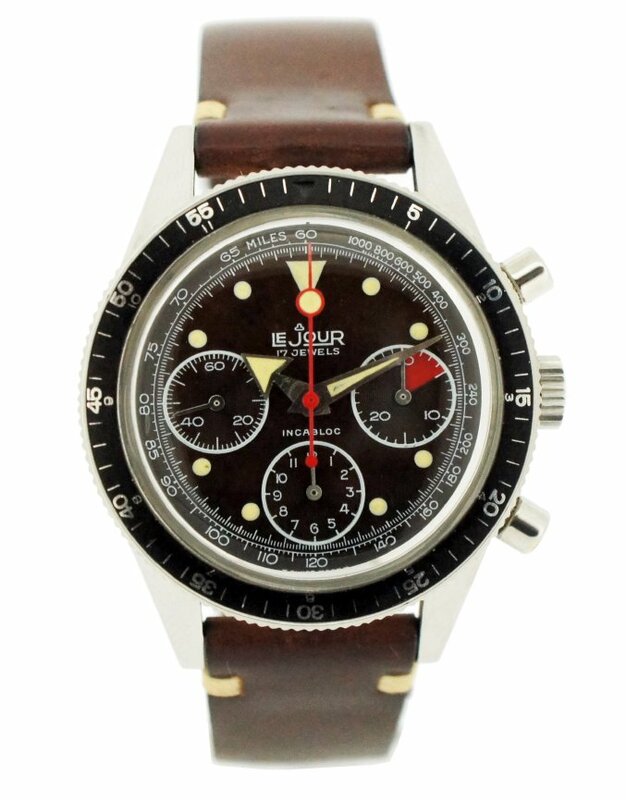 This was witnessed when the most valuable Rolex Oyster Chronograph in history with a Valjoux 72 sold for a million Swiss francs at auction in Geneva.